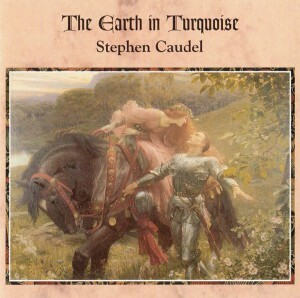 Stephen Caudel is a brilliant multi instrumentalist that first came to my notice in the early 80’s. It was just about the time that the CD format started to really break in the UK. I remember hearing his ‘Wine Dark Sea’ playing in a shop and purchasing it as one of my first ever CDs. ‘Wine’ was easily the best of all the CODA label releases in the 80’s and the music from it was regularly featured on television’s ‘Art of Landscape’ programmes. Caudel’s music can only be described as “one-man rock symphonies” – it starts in the realms of rock and crosses right over the musical spectrum to touch on classical music, with its rich, at times grandiose displays of intricate guitar work and superb keyboard craftsmanship. I have often said that had M. Oldfield not emerged from the depth of Virgin’s Manor studios with his ‘Tubular Bells’ epic under his arm, then Stephen Caudel may have made it big with his own brand of multi-instrumental sound painting, but I dare say Richard Branson may not have been too happy about it!!! Fans of Austria’s multi-instrumental genius: Gandalf will also derive much pleasure from listening to the music of this wonderful composer, as will lovers of Steve Hackett’s magical merging of electric/acoustic guitars, keyboards and percussion. Mike Oldfield is also a good reference point, but Caudel’s music is much more majestic, considerably less quirky and more solidly structured than earlier Oldfield material. Alan Freeman has been giving the CD his full support on his new Virgin Radio “Rock Show” – knowing Fluff’s musical tastes as we do, it is hardly surprising he is championing Caudel’s music. So, let’s take you through the CD track by track …… Track 1 is the title cut and it’s a kind of prelude that introduces motifs of characters and events from the album as a whole. It opens with soft flute sounds & synth strings that create a very relaxed setting before synth trumpets & massed choir effects break on to the scene with bursts of powerful dramatics to herald the arrival of an acoustic guitar that carries the main melody over a sea of swirling synth oboes & strings. This track has a wonderful “days of old” feel about it! ‘Call of Destiny’, is a dramatic nine minute piece that looks into the mists of time as it depicts an army legion on the march. Stylistically, it is very similar to Steve Hackett material with keyboard flutes, brasses & strings revolving around a ‘Bolero’ like central theme, before it breaks off into some stunning electric/acoustic guitar interplay. This series of majestically sweeping themes takes the music from its darker beginning into a brighter progressive sound that Camel (specifically Andy Latimer) fans will really go for. Track 3 is ‘Coronation’, a grandiose four minute work with the electronic flutes & strings creating a vision of some kind of royal pageantry display where synth choirs, brass & percussion build the piece up into a splendid collage of majestic keyboard orchestrations. Then it’s straight into rock territory with six minutes of Prog heaven on ‘Gargantuan’, where soaring electric guitars sing over layers of strings & brass samples, taking the music on a wonderfully melodic path that will haunt the ears of symphonic rock fans for years to come – Classic stuff that I defy any bands from the prog genre to beat … brilliant music that’s a prog fan’s dream! ‘Forbidden Love’ follows and it’s a beautifully romantically inclined work with a stunning melody performed on acoustic guitar and set on a background of flowing strings – a lovely piece that Hackett or Anthony Phillips fans will adore. It’s back to a more ethereal, dramatic style for ‘Dark of Night’ – an evocative six minutes of symphonic wonder that is initially dominated by keyboards, but as the track builds up the percussion & choirs effects rejoin the show, with guitar of the “soaring into the heavens” variety making a welcome return with interludes of flute & acoustic guitar giving the track a more segmented feel towards the closing moments. The five minute epic ‘Eve of the Battle/Dawn’ is introduced with a sea of soft string & mystical flute sounds floating behind a beautifully honed acoustic guitar melody. Suddenly a crazed electric guitar solo makes a surprising entrance and proceeds to tear its way through the scene in ferocious manner. Wild, crashing percussion then builds the scene up to fever pitch and then the calming sounds of more strings & flutes take over again to lead the track towards a grandiose symphonic finale full of sweeping strings & masses of other orchestral sounds. The nine minute closer comes in the shape of ‘A Legend Is Born’, where a pulsing rhythm creates the base for the oncoming display of soaring electric guitars & thematic synth chords with some fine, but brief acoustic guitar parts creating breathing space before the powerful electric onslaught continues in grand Hackett-esque fashion. At the half-way mark the track steps down a few gears and moves back into symphonic territory with the acoustic guitar crying over a sombre Mellotron like string backdrop – an extremely vivid emotional ending. Overall, ‘Earth in Turquoise’ is a superb example of “real” instrumental symphonic rock music and it falls mainly into two categories as far as a CD services audience is concerned. 1) The Gandalf style of melodic, electronic sound-painting – & 2) The more symphonic areas of progressive rock where the likes of Steve Hackett & Camel reign as rulers of that kingdom – but in this CD, the two have found a worthy adversary and strong challenger for the symphonic rock crown – An album full of glorious guitar/keyboard based themes that will thrill and move any fan of either of the two genres – A winner for sure!